QRadar SIEM Security 3105 appliance uses cybersecurity AI and machine learning technology that automates security tasks like threat hunting via scans, searches, alerts and reports using event logs and network traffic flows for internal and external attacks, as well as risks and vulnerabilities in your network. 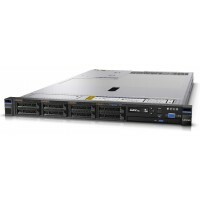 The SIEM Security QRadar 3105 appliance automatically detects and prioritizes cybersecurity threats and internal user violations by integrating cybersecurity AI, user behavior analytics and machine learning technology into searches, scans, alerts and reports which simplifies and speeds implementation and ongoing security enforcement. QRadar filters out the clutter from the millions of event logs and network flows, and presents you with the critical events you need to focus. QRadar can support and parse the logs of all your existing security tools, devices, applications, databases, so you do not have to replace anything you currently own. The QRadar SIEM Security 3105 appliance can be used for various purposes in your SOC deployment, including as an All-In-One security information event management appliance, or as a dedicated event log processor, network traffic flow processor, console, risk manager, vulnerability manager, log manager or an event log plus flow processor combination. At any point in time, the SIEM Security QRadar appliance can be changed into any of the above mentioned roles. Additional SIEM Security QRadar appliances can be added to your SOC for various needs, and customers can provide their own hardware using QRadar software licenses, providing flexible scaling options. Put simply, QRadar SIEM Security efficiently filters out the noise to pin point actual threats and vulnerabilities using cybersecurity AI and behavior analytics machine learning to detect both internal and cybersecurity threats using real-time security AI. No other SIEM on the market has these capabilities, nor are they as quick to deploy and simple to operate. For larger environments, view the QRadar SIEM 3129, 3148, 4412-Q2A or 4412-Q3B Appliances.